Oh woman, this recipe has been waiting in my back pocket for weeks now. I honestly thought I'd just make a quick, low-effort post, but simply couldn't make time for it. Because I've been so busy, I also feel like my diet has mostly consisted of bread. I hate it when I can't find the time and energy for cooking, because it helps me feel balanced. I have been having fun with all the things that kept me busy, but just looking at this meal makes me hungry! 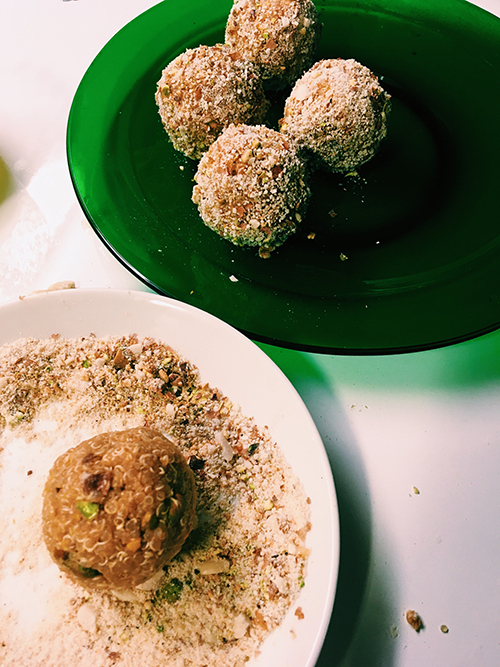 I've made these quinoa balls a couple of times now, with both pistachios and peanuts. 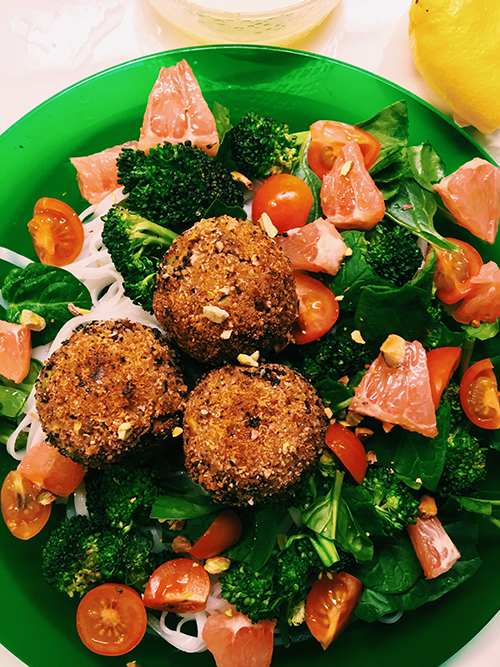 We don't save oil when frying the quinoa balls, so to serve with: some veggies, rice noodles, pink grapefruit and wasabi vinaigrette! For extra seasoning I used some natural umami powder, smoked paprika powder and a little bit of liquid smoke. Served with: rice noodles, broccoli, spinach, tomato, and pink grapefruit. 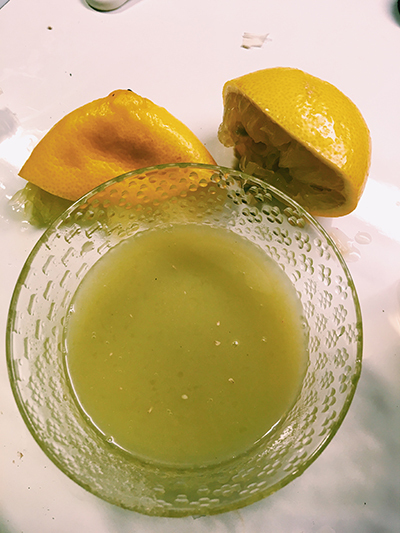 And don't forget the wasabi vinaigrette! Recipe further below. Start by cooking the quinoa. If you're usuall complaining how your quinoa comes out as sticky porridge - don't worry, that's an advantage here. While your quinoa is cooking, you can prepare the rest: crush the peanuts or pistachios using a mortar or simply a large knife, grate the ginger, and so on. When the quinoa is cooked, let it cool down a little. Mix the sesame oil, soy sauce, garlic, brown sugar, and other seasonings with the quinoa. Add the soy flour (or potato flour) / water mix into the quinoa and mix well. Now add the pistachios - if you're left with small crumbs or dust, save that for later. If the quinoa is too wet for shaping, add some breadcrumbs into the mix. Take a plate and cover it with breadcrumbs and the leftover pistachios crumbs / dust. Shape the quinoa into balls, and roll around the breadcrumbs. Cover a pan with oil and heat up. Fry the quinoa balls evenly until you get a crisp, brown surface. Simple: whisk everything together. Using a small whisk works better than a fork, if your wasabi paste is thick.